Take the awesome power of your Microsoft Xbox One console, and give it the portability and convenience of the Nintendo Switch. 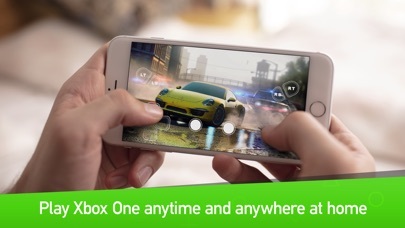 Stream your Xbox One games to your iPhone, iPad or iPod touch and play from anywhere with access to your home network. Never again will your gaming be interrupted when someone else needs to use the TV! 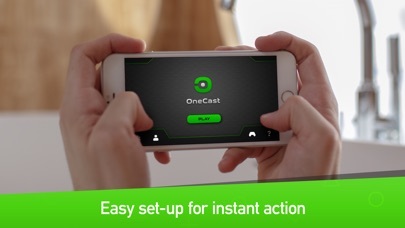 OneCast features: • Supports HD 1080p video for crisp, smooth gameplay • Various control methods including any MFi game controller and the built in virtual on-screen controller • Highly tuned performance with extremely low lag • Multiple profile support so you can use any number of different Xbox One consoles or Xbox Live gamertags • Customise the virtual on-screen controller to your liking • Quick and easy one-time setup, start playing within seconds Notes --- • For the best streaming experience, your Xbox One should be connected to your home network via LAN cable and your iPhone, iPad or iPod touch should be connected to a 5GHz WiFi network. • You will be required to sign in with your Xbox Live gamertag in order to register your Xbox One console with the app. 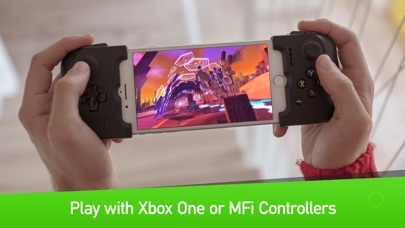 • In order to use your Xbox One wireless controller to play games with OneCast, you must be physically close enough to your Xbox One console to allow the controller to establish a wireless connection directly with the console. • If you need any assistance, our technical support team are on hand and are committed to quickly resolving any issues that you may encounter. Disclaimer: Xbox, Xbox One, and Xbox Live are trademarks of Microsoft Corporation. OneCast is in no way endorsed by or affiliated with Microsoft Corporation, or any associated subsidiaries, logos or trademarks. I bought this wanting to play my Xbox from anywhere on the go, preferably with a WiFi connection. Unfortunately, I have to be on the same WiFi network— which in my opinion, is relatively pointless since I can only play within 100 ft of where my Xbox is anyways... may as well play it on my TV. Not exactly “the convenience of the Switch”. I will say this app was very fluid when I played Skyrim in my house, and it’s good at what it is. But I won’t be using it, upset I spent money on this. By it's worth every penny!! This App has been very useful for my household. Because of my Xbox setup. I have a full racing rig in my bedroom and sometimes I just want sit back on the couch and play something other than racing games and now it’s possible thanks to this app. setup is quick and the app is easy to use. I recommend using medium graphics settings on the iPad. And you will have very minimal lag or glitches. If you have decent WiFi speeds. The price of this App may seem expensive but the quality shows. 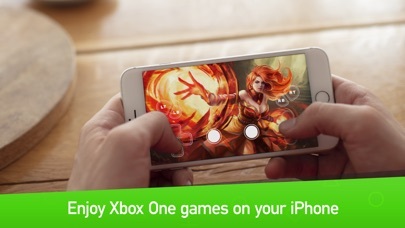 And less we forgot we are talking about using our Apple devices to play our Xbox. So of course there will be an Apple tax lol. The Next Big Thing Is Here !!!! This app is about 90-95% done. I barely get any lag. It is amazing how cool this app is and how easy it is to use. Definitely worth the $11.99 !!! Great job !!! These heroes need to be considered for the Nobel prize. I love playing my Xbox on any screen in 4K with zero lag. Even the 2019 5k iMac 27”. Even the guys st my local Apple shop were stunned by that one. I no longer need to buy a separate 4K or 5k monitor because I already have the ~13” iPad and MacBook Pro. Great way to let apple lovers feel the tingle of freedom android loyalists derive their superiority from. I see why. It’s nice. If you spring for a premium internet plan at home....not the crazy top tier for developers but the high end plan for regular people; this will work better if you buy the Linksys VELOP whole home mesh WiFi. It will turn your WiFi into Sosa/McGwire ‘99. And plug the router hardwire to the Xbox if possible. It’s expensive but so was the cream and the clear....and Barry Bonds hit more runs than anyone ever. Rest my case. Simply incredible! Worth every Cent!! 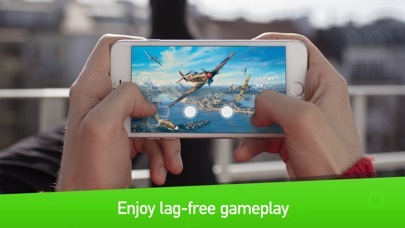 If you have an XBOX and an iPhone or iPad this is a no brainer totally lag free experience. Just finished up playing Halo online with a friend for two hours. I streamed it to the iPad Pro and had no issues whatsoever. The support team went above and beyond to assist me in getting the app to work in my overly complicated environment. It is truly rare these days to find this level of support. Thanks again! Every time I try to connect my Xbox one it won’t work. I’ve unplugged it for 30 seconds. But nothing. Please help me here.